I like to think of myself as a fairly decisive person. It takes me a while to make up my mind, but once I’ve thought things through I generally know what I want, and I stick to it. There is some dithering in the beginning while I try to hold all the possibilities open, but I am generally pretty comfortable making the final call. In some seasons of life, though, there are a lot of decisions to be made. And I’ve found that they usually come all at once. It’s never one major decision, but six. In those moments, I find myself feeling terribly indecisive. The decision muscle gets overworked, and suddenly something as simple as choosing what’s for dinner is just too much. Even simple things can be hard to choose when you’re busy re-deciding the whole rest of your life. So let’s just say that I am feeling a bit overwhelmed by the current bounty of choice. I don’t know what to work on. I can’t seem to focus on any one thing long enough to make any particular progress on it before spiraling off to do or research some other important thing. Me being indecisive is pretty unusual. Me being unfocused is downright unheard of, but so it is. I want one sample for each kind of wool that I sell, and realized that I am short a Shetland and a Rambouillet from the new supplier. I’m 2 oz in, and have a slightly overplied sock weight yarn, chain plied to keep the color repeats pure. I am kind of surprised at how much I love it. But maybe that’s just because it is solid evidence that I have actually managed to produce one whole skein of yarn. That feels like a good reason to love it. 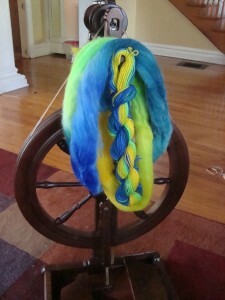 So here’s the question: do I finish the spinning as I had originally planned, or do I take this opportunity to play? Well, I say play! To keep it simple, don’t over-think the playing too much, just go with it. The yarn and the fiber are gorgeous. Part of me says keep the fiber as a sample; part of me says show the options in spinning. Hmm, I guess indecisiveness is catching. But the selfish in me is winning out – I want to see what else you can do with that fiber! I’d be tempted to leave some of the fiber as a sample for the time being, although the idea of playing with it to show the options is really compelling. (Says the non-spinner. 🙂 ) Good luck with all the decisions! It’s truly beautiful and I’m sure you will find the right end use/technique for it. DesigKnit is powered by	WordPress 4.8.9 . Page generated in 0.309 seconds using 39 queries.